Do you eat? I do, everyday, and love it! I eat well and without guilt, because I strive to eat according to certain principles. I think that things worth doing are worth doing well, and for me that means doing things the "good" way. You'll hear my talk more about "good" if you continue to read my blog, but I'll start by saying that the good way is the right way, the moral way, and the thoughtful way. The way that is the least harmful and the most beneficial. It is Local, Seasonal and Sustainable. I grew up on a New England sheep farm, and there learned an appreciation for the outdoors and hard work that most people don't get to experience. When I was 9 I had my own horse, and took care of him all by myself, as my mother hated horses. We grew much of our own foods, raised lamb and chickens and goats and ducks, built our own house, chopped our own wood for fuel and had a pretty good life. That childhood experience has shaped the course of my life. Farming and growing, working hard and together have become essential to a life lived with value, courage and joy. It has not been easy for me. At the age of 30 I was diagnosed with bi-polar disorder, a much misunderstood mood disorder cause by a chemical imbalance in the brain. It has been a bit of a roller coaster over the last 13 years, but I try to stay focused, and strive to live a balanced life in harmony with my environment. Yoga, knitting, medication and my family's continual support help me stay on the top side of this crazy tightrope we call life. This morning, as I walked up the cool dewy driveway to feed the horses, I noticed something in their pasture that hadn’t been there yesterday. The pasture grows rocks; I know because I pick them up and toss them over the fence regularly, yet there still seem to be plenty around. This didn’t look quite like rocks though, or any of the other paraphernalia the horses lose in the pasture, so I walked down to investigate. Hooray! It was what I was hoping they might be…some puffball mushrooms. They must have blossomed in the field after the hard, much needed rain we had yesterday afternoon. The horse had stepped on some of them, but I managed to salvage some good mushrooms “for the pot”. I didn’t have my camera with me, so I can’t show you, but there was clear swath of darker color in the grass where the fungus was growing, like a big comma, and there was a sweep of puffballs, the fruit of the fungus, blooming right down the center. As I walked back home with my loot I got to reflecting about mushrooms, for which I have a deep fondness. They often grow in dead or dying material. In other words, they are a product of decay. It amazes me that nature is structured in such a way that life flows naturally from death. Take compost, for instance. I have a compost pile into which I tossed a rotting pumpkin last year, as well as all my other garden waste. This year I can’t see my compost pile for the hybrid squash/pumpkin Audrey III growing there. Abundance from decay. And yet we still see death as a finality. Back in the kitchen putting away the mushrooms, I was chagrined to remember that I have two dozen jalapenos, 10 ripe tomatoes, 4 cabbages, 6 cucumbers, 2 giant zucchini the size of my arm, 3 peppers, a basket of green beans and a watermelon already stuffed in the fridge. Why can’t I find a score of puffball mushrooms in February, when there is nary a fresh thing in sight? So I’ll make some hot sauce, roast the tomatoes for the freezer (a yummy trick I learned from my mother-in-law) whip up some coleslaw for dinner, jar some pickles, freeze the green beans, and leave the zucchini in my neighbors car, but I am definitely having a mushroom omelet for breakfast. Heat a nonstick pan on medium low heat. Crack the eggs in a bowl and scramble lightly with a fork. Saute the mushrooms in 1/2 the butter until tender and most of the water has evaporated. If the mushrooms dry out before they are cooked through, add a tablespoon of water to the pan and cook until it’s dry again. Add the eggs and the rest of the butter and cover for 2-3 min. When the eggs are mostly cooked, add the cheese to one side and gently fold the eggs onto the cheese. Turn off the heat. Cover again for a few more minutes until eggs are cooked through. You may have wondered whatever happened to me and my sometimes blog. Well, I’ll tell you. Last spring I was offered my dream job. I was hired to design, build and manage a teaching garden for the Marvelwood School, a small Connecticut private school that both my sons attend. I get to spend part of each day planning, organizing and actually digging in the dirt. It was a very successful first season, and it just keeps getting better. I was offered the use of a small greenhouse on the campus so I can continue puttering about with growing things this winter. I’ll tell you a little secret…I’m experimenting with aquaponics too! I already have 8 little goldfish working hard to produce nitrogen for my sprouts. Well, they actually produce ammonia that will turn into nitrites that will turn into…that’s a story for another day, though. Today we’re gonna talk about a freakishly warm December. It’s freakishly warm, right? What the heck! I waited until late late late in November to plant garlic, which I usually plant in the end of October, and still the garlic has sprouted and is 4 inches tall. Further disturbing evidence of this unusual weather is the fact that my parsley is actually growing. I have been pulling it in fist-fulls to use in the kitchen, but still it grows. Hard not to when it’s 60 degrees out. I have still been able to plant narcissus bulbs, as the ground isn’t nearly frozen yet, and whenever I hit one that’s already there I find it has sprouted and is trying to pop out of the earth. My strawberries have actual flowers, for crying out loud! What gives? Anyone? Even I, who loves growing things, am ready for the season to end. Enough already. I’m trying to pretend it’s winter. Despite the fact that they are still green and healthy, I pulled out my leeks today. They last almost as long in the fridge as in the ground, and I keep telling myself there has to be a hard freeze soon, so I might as well get them out now. Of course I was wearing a T-shirt while I dug, so it really was pretend. I could have probably left them in another month. I decided to make a real one pot winter style meal tonight with some of the leeks and other put-up foods to try to get in the winter mood. I used the parsley, some potatoes and onions I have in the cellar, and some pheasant leg meat I had left over from a broth I made. I also had the good fortune to trade a venison sirloin for some guanciale with my good friend Sarah. For those of you who are scratching your head (like me the first time I heard of it), it’s a pork jowl. That’s right…pig cheeks. and I’m here to tell you that it’s one tasty item! It’s an Italian specialty food traditionally used in carbonara, and it is super yummy. More delicate than pancetta, and with a stronger taste than bacon, it ramps up the flavor of any dish. Here I sauteed it until crisp, removed it with a slotted spoon and cooked the leeks and onions in the fat left in the pan. The potatoes I diced and cooked until soft in salted water, added them to the leeks and fried them until a little crispy. After that I added the removed guanciale, the parsley, the pheasant, salt and pepper to taste, a pinch of cayenne and finally shredded Havarti on the whole thing, covered it and turned off the heat. Meanwhile I had a nice winter cocktail to get me in the holiday spirit. Nothing wrong with rum and eggnog, am I right? The final product was a stick to your ribs one-dish meal that made everyone happy. It’s still about 50 degrees out, but I’m going to go decorate my Christmas tree and pretend. Happy Holidays! 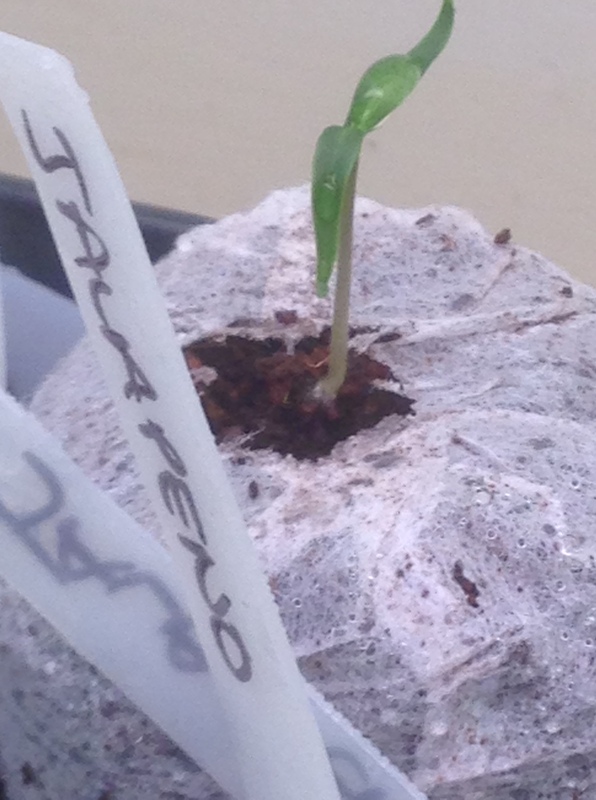 Eight days have passed since I tucked my tiny fragile jalapeno seeds into their specially prepared pre-moistened fist sized cloth pods nestled in a self contained semi-hydroponic plastic covered temperature regulated solar nest. Along with my tucking I did some quick praying to speed their journey toward new life, prolific growth and eventually their ultimate demise in my sauce pan. It sounds a bit hard-hearted when I put it that way. Today when I ducked under the lights to peak below the plastic I was rewarded with six new pepper sprouts. Hurrah! The sad news is that it’s been eight days for my eggplant seeds as well, and not one of the precious babies has responded to my careful attempts to coax them into existence. What is it exactly that makes a seed grow into a plant? 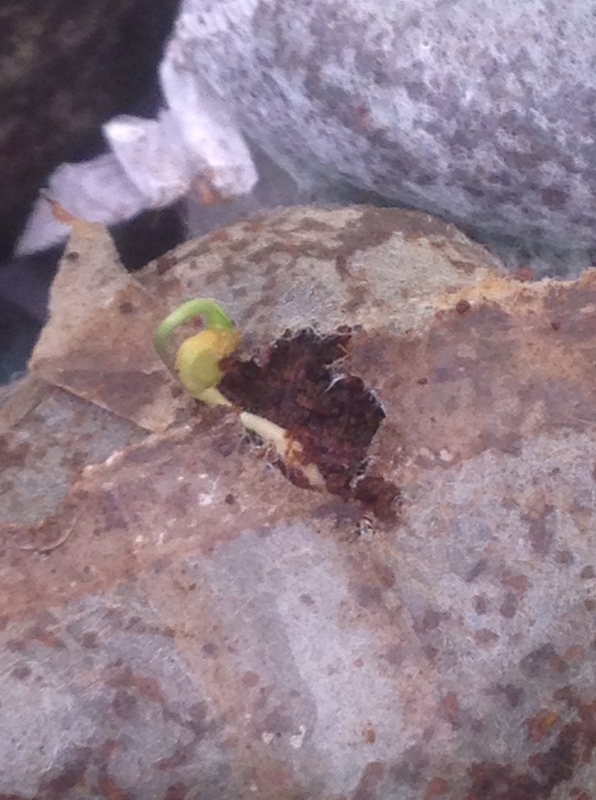 I mean, I know all the things a seed needs, as far as moisture, soil, sunlight, etc etc, but what actually makes it have new life? What mystery is at work that causes some seeds to crack open and begin splitting cells to form the complex structures and mechanisms for photosynthesis? This for me, and I dare say for gardeners everywhere, is one of the fascinations of gardening. But what about those seeds that don’t sprout? Could I have done something differently? Are they just “bad seeds”? Who can tell me this? Instead of worrying about them, I have decided to go against my nature, be patience, have some faith, and wait another week. 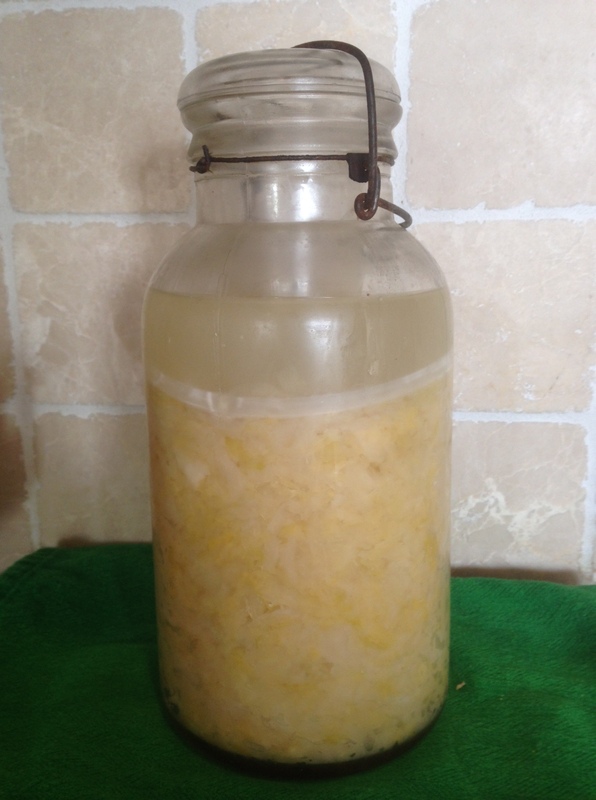 On another note, after several failed attempts to set up a lacto-fermentation system for my sauerkraut, (I’m too cheap to purchase a proper crock and weights) I finally settled on a glass jar with a smaller glass inside to act as a weight pressing on a piece of plastic that I cut to fit the jar. The benefit of glass is that I can monitor the moisture level so that no dangerous bacteria can breach the salted water and spoil the cabbage. Plus it’s fun to watch the bubbles! The trick is to make sure that all of the food is below the level of the water so no nasty bacteria can land on a stray floater, travel down and spoil the food. The brine acts like a barrier. Meanwhile chemistry dictates that the Lactobacillus bacteria, which is on most surfaces already, is changing the sugars into lactic acid, a natural preservative, probiotic and probable anti-carcinogen. (or something like that). If you want to try it yourself, there are plenty of good sauerkraut receipts online. In 4 to 6 weeks we’ll be chomping away at the heavenly kraut, increasing the beneficial bacteria in our digestive systems and preventing cancer at the same time. Another Hurrah! February and March may seem like the absolute doldrums for gardeners in the North East, but for me this is really where the fun begins. Starting in mid January my daily run to the post is enhanced by the plethora of seed catalogs and gardener supply fliers that inundate the more mundane sampling of bills and offers of credit. These magazines, filled with flawless, sparkling, brightly colored fruits and flowers not only bring the remembrance of springtime just when it seems like winter will never end, but spark the planning and scheming process that every gardener goes through each year. Moreover, for me they offer not just ideas and choices of what to grow, but actual hope for the delights of spring, and desire for a bountiful garden, in much the same way that ads for fancy skin cream lure us in with the unattainable promise of youth and beauty. I know it sounds foolish, but there it is. This winter, when John Scheepers and Gurney’s and Burpee came to tempt me with their seductive photos, I threw them immediately into the recycle bin, and here’s why. Last fall on my birthday I received a wonderful present from a girlfriend of mine. It was a gardeners journal, a subscription to Heirloom Gardener, and a seed catalog from Baker Creek. She knows me well. I devoured the magazine. I learned more about GMOs and gardening history in the US, and I vowed that never again would I plant a seed whose origin was questionable. I saved the seed catalog for February. When I plan my garden in the spring I start with a list of what I’d like to grow. Then I make a map of my garden and, referring to last years map, add each thing where I feel it would grow best. When I actually do the work my plan often changes, if, for instance, I bought more tomatoes than will fit in the allotted space. Sometimes I cluster, other years I might mix it up, say putting the carrots in with the beets or planting every other tomato and pepper. My garden is quite small, so I often cram. Every year I plant some things from seed, like beets, and beans, and carrots, and some things from plants that I purchase, like tomatoes and squash and melon. The only things I start from seed indoors myself are pepper plants and this mostly because I have more of a selection than I can find at the greenhouse. Deciding to choose heirloom and non GMO plants means that I have to either find a source for heirloom plants, or grow them myself. While there is a local CSA that I believe sells plants in the spring, I didn’t want to limit my choices, and since I have had some luck with peppers, I decided to go ahead and start my entire garden from seed. That means all the tomatoes, melons, squash, eggplant, cucumber, spices, cabbage and peppers. Yikes! Last month I finally made my choices from the Bakers Creek Heirloom Seed Company catalog. I highly recommend this company to anyone who is a vegetable fanatic. Their selection is unbelievable and their knowledge extensive. Their website has tons of valuable information and it’s just fun to browse. Check it out at www.rareseeds.com After days and weeks of poring over the descriptions and photographs of exotic and divine vegetables (am I the only one who finds vegetables alluring?) I ordered 38 types of seeds. 10 types of tomato alone, with names like Green Zebra and Black Prince. Where I’ll put them is still a mystery. I made a schedule by counting back in weeks from the average last frost date (May 20th). I borrowed some growing lamps and purchased seed pots and starter mix. I rearranged my bathroom and tub area to fit the seed trays. I planted the onions and the eggplant. While I tell myself that it’s the best thing to do, I remain nervous about starting all the seeds myself. I’m not a very technical person but I’m smart enough to know that if I was, I’d have a better chance of growing healthy plants. There is a science to it that I have yet to figure out. My policy of flying by the seat of my pants and hoping things work out for the best might not serve me so well in this instance. If I were so inclined, I would spend some time figuring out optimal light cycles, temperatures, nitrogen mixes and hardening practices for different types of plants. Then again, it’s just nature, after all, and there really is no stopping it. The worst case scenario is that I have to source the plants after all. It’s not like I’ll never eat another homegrown tomato if my seeds fail to thrive. And there is hope! 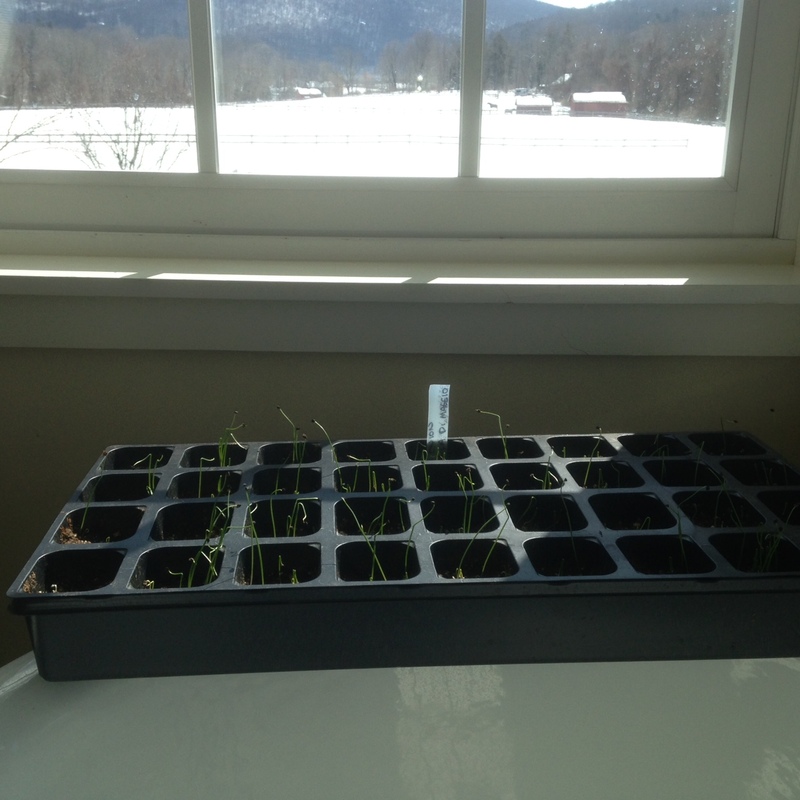 Even though there is still 2 feet of snow on the ground, my 300 onions are already an inch tall. I’d love to hear from anyone with any advice or expertise on starting plants indoors. My set-up is not very complicated, but advice on light times, bulbs, best starter mix, or just about anything would be much appreciated. Happy growing! Wow, it’s been a long time since I wrote! I had a very busy summer in the garden. This New England summer was very mild, and the cooler than usual weather made for a lush and productive garden. It was an exceptional year for tomatoes, and as we head into October I am still picking. Most of my tomato plants got the blight, as usual, but this year it was so late as to not affect the fruit. In fact as the days get shorter the plants are having a last comeback and still producing. To prevent the fruit from splitting on the vine, I pick them under-ripe and mature them on the counter or in paper bags for a few days. The flavor is a bit tangier than the full sun ripened fruit, but they are still delicious. 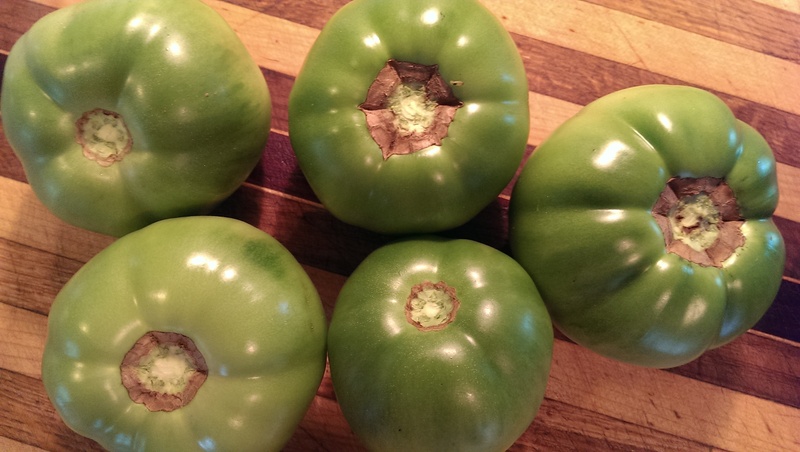 I will still have many green ones on the vine when the first frost comes in, so I’ve been perfecting my recipe for green tomato salsa in advance. This time of year is almost as exciting for me as the spring. It is as much a time of abundance and good eating as the peak of summer. This may be because I usually plant a garden heavy on fall producing veggies like kale, peppers and potatoes, parsnips, beets and carrots, but it’s also a time for preparing foods for the winter. I’m spending my days chopping, stewing and freezing tomatoes, roasting hot and mild peppers and making chili sauces to spice up the long winter. I’ve got quite a few things going on in the kitchen as well as the garden. The peppers had a nice year. I planted a mixed variety and like always, quickly lost track of what I planted where. While this might bother some, I find it exciting to watch the unknown plants grow and see how they eventually reveal themselves. 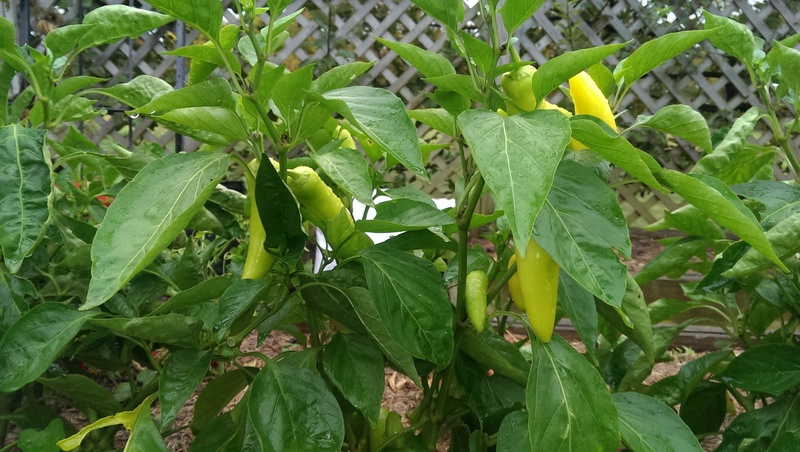 This year we had a cayenne variety, jalapenos, poblanos, banana peppers, green chilies and regular old green bells. The mix was great, as some we used for stuffing, some for fresh sauces, some for cooked sauces, some roasted and jarred, and some fresh with dip. As peppers are perennial, I have even planted some in pots to bring inside and have for the winter. This is a first for me, but I have been reading up on it and I’ll let you know how it goes. Remember to always wear gloves when handling hot chilies. 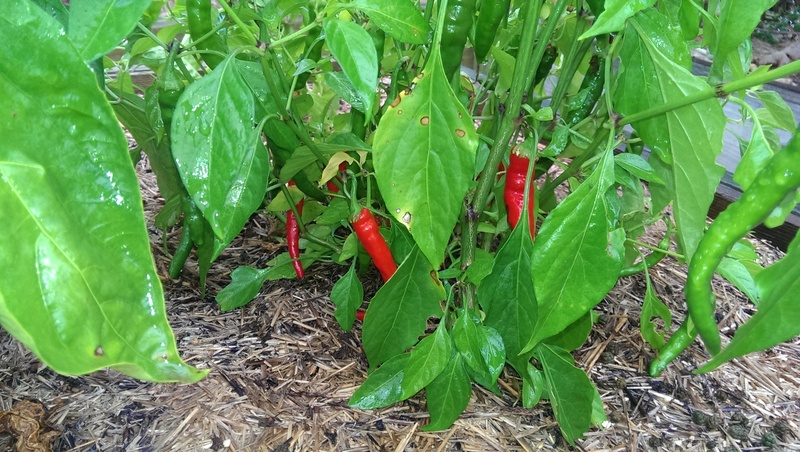 Even the milder chilies can get under rings and nails and cause irritation and burning. Lingering chili oil can make itself known when you try to take out your contacts. Never never wipe your face or eyes. I have learned these lessons the hard way and I always wear the kind of rubber gloves you find in the doctors office. They fit close and keep the capsasin off the skin. Also, instead of using a cutting board and knife, try snipping the chilies with scissors right into the bowl. This will keep the oil out of the cutting board and therefore out of the next thing you cut on it. 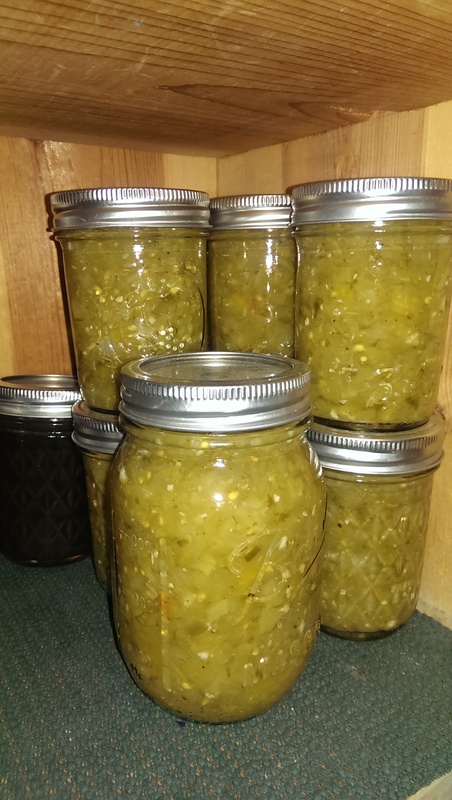 One of my favorite things to do with the abundance of peppers is to make green chili sauce. I first had it prepared by a very good friend and former roommate Rachael Risley (nee. Coulehan), who makes it with a slow cooked pork shoulder. As it’s very difficult to get organic free range pork of any kind, let alone a shoulder roast, we usually make it with chicken. Served with cornbread or tortilla chips, it’s a hearty and satisfying dish perfect for the cooler fall temps. I make the sauce first, pour it over shredded or cubed chicken and bake it with cheese like a casserole. 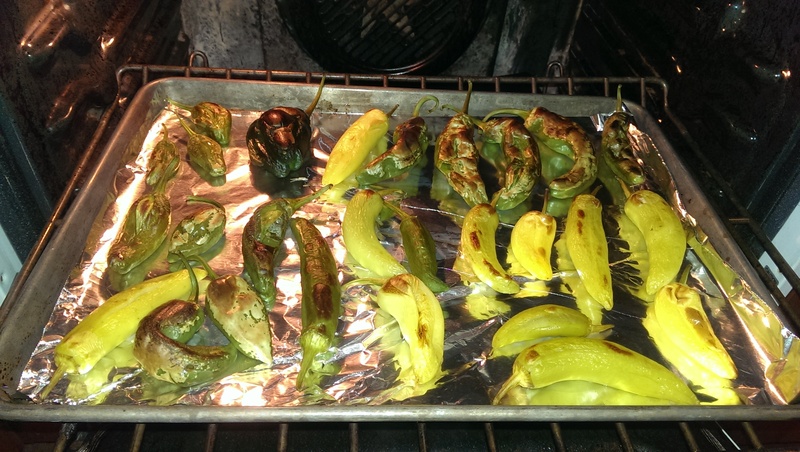 The trick to really good sauce is to roast the peppers first, skin and seed them and then make the sauce. Chopped and sauteed, they just don’t have the rich flavor that roasting adds. It is an extra step, but well worth the effort. Blister the chilies on high heat, flipping once to get both sides. 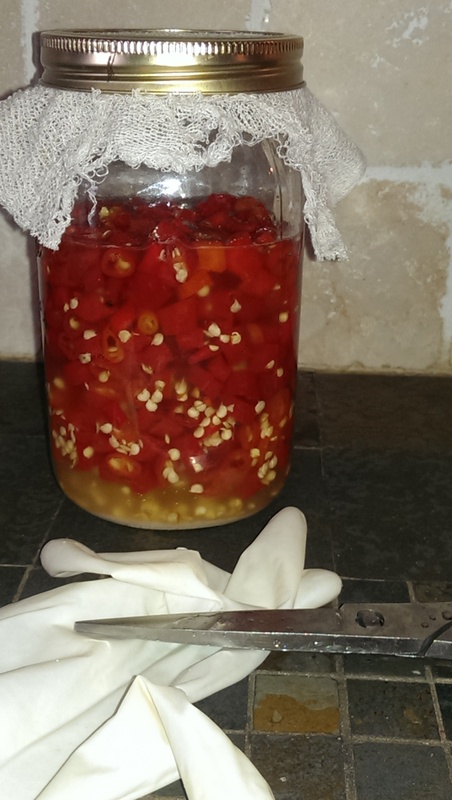 Put the chilies in a glass bowl, cover with a plate and let cool. This will steam the chilies and make it easier to remove the skins. When cool, remove the skin, seeds and ribs, reserving the liquid in the bowl. Set aside. In a medium sauce pot, saute the onions in the olive oil until fragrant, about 10 minutes. Add the garlic and saute two minutes more. Stir in the flour. Add the broth and cook until thick and bubbly. Add the chilies and cook for 5 minutes more. With an immersion blender puree the mixture, leaving some peppers and onions whole. If you don’t have an immersion blender, add 3/4 of the mixture to a blender, cover with a dish cloth to allow steam to escape and blend on high 1 minute. Return to pan. Add salt and pepper to taste. Serve over chopped or shredded chicken, pork or enchiladas. Enjoy! I use a lot of garlic. There is nothing like that fragrant allium for flavoring all kinds of dishes, from meats and pastas to vegetables of every sort. Very easy to grow, it’s planted in the late fall and harvested in the summer. Not bothered by pests, there is nothing much to it, really. Unless, of course you forget all about it. I had so much garlic from the previous year that I forgotten about the garlic patch until it made itself know to me by sprouting again last September as I was putting my garden to bed. Uh-oh. 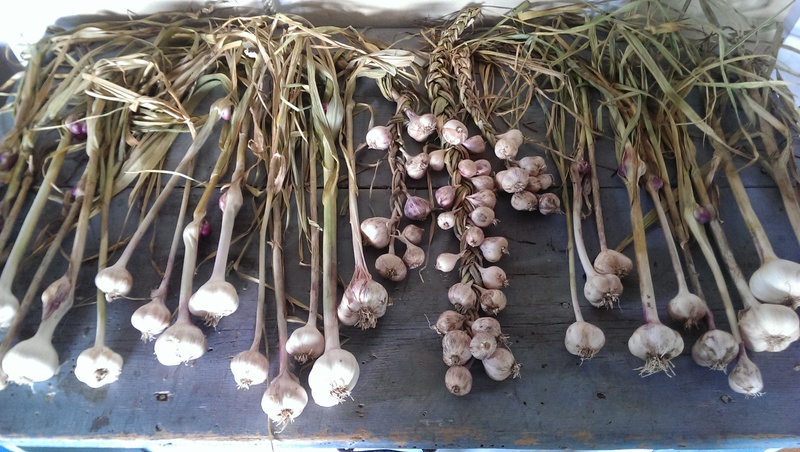 September is not the time to harvest garlic. So I left them. 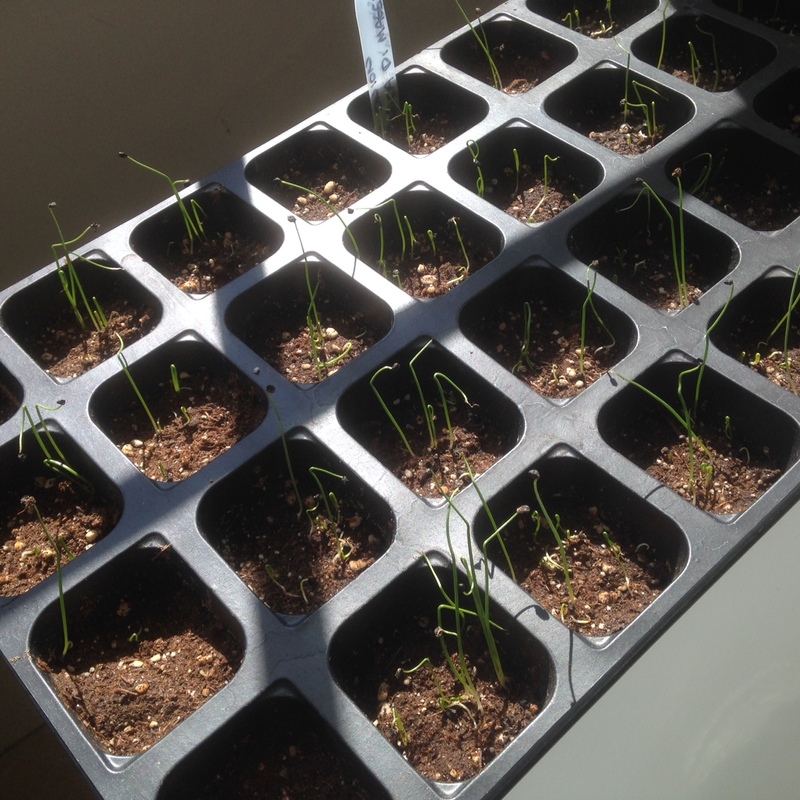 They withered and died and sprouted again the next spring, but this time instead of single stalks from individual cloves, I had many many sprouts from whole heads of garlic. Bushes of garlic. This year I determined to harvest them at the right time. Plus I was out of garlic. Garlic should be picked when the stalks are still green but beginning to brown. It’s not rocket science, but it does need to be done. If you pick it too early, the paper is hard and difficult to peel, and the heads won’t be fully formed. Too late and you risk the bulbs separating, the paper will be too thin and then they won’t store well. July is a good time to do it. Although it’s tempting to grab those sturdy stalks and yank, unless you loosen the ground first they will break and then you’ll be digging around with your trowel and risk damaging the bulb. I dig a big scoop out of the dirt in front of the garlic, and then bend it toward the loosened earth until it comes free. Because I had left mine so long in the ground and the bulbs had sprouted close together, most of the garlic was very small. Perfect for a garlic braid! I made sure to pick every one; the ones I get next year will be the ones I plant this fall! Garlic is excellent fresh, but it must be cured in order to keep. This is best done out of the sun, in a cool, well ventilated area, and takes a few weeks until the papery stalks dry. Leave the stalks on for this, and cut them only when you transfer the cured garlic to its storage area. I keep mine in a basket in our cool basement. Keep it away from moisture unless you want it to sprout in the basket. Last night we had beet greens braised with garlic cloves. The fresh cloves are much milder than the cured. It was really delicious and a good way to get in those healthy greens. Wash and chop the greens and add them to a large stock pot. (add as much as will fit. They cook down to nothing) Peel and crush, not chop, the cloves of 1 head of garlic. Add to the greens and pour the broth over. Cover and simmer 20 min, longer for sturdier greens. Enjoy! Everything in the garden has a season. Most often just when we are entirely sick of one vegetable, another begins to ripen, giving us a change for a while until we are sick of that one too. Some we never get tired of eating and they are gone all too soon, like peas and strawberries, but others come in hard and fast, in abundance, and we have to eat them, freeze them, pickle or jar them, or just give them away as fast as we can. Take green beans, for instance. We have been eating radishes, lettuces, kale and cucumbers for weeks now, and I have been watching the delicate purple flowers of the beans develop anxiously. Haricot verts thinner than a cu-tip, lightly steamed and gobbled up with just a touch of salt are simply divine. But in just a few days of picking I start to notice the ones I missed on the first few rounds are now the size of a pencil, and no longer bright green but dusky and even purplish. I sweep through the bean patch, picking everything I see, and haul in about 3 gallons of beans. Some we eat fresh. Some we pickle. Some we freeze. The next day….more beans. Ugh! But I know there is an end in sight, and I’ll be happy to use the ones I put up in soups and salads throughout the long months of winter. Today, though, I’m sick of beans. Not so tomatoes. I could eat a fresh tomato every day of my life and be a happy person for it. Anyone who has had a tomato fresh out of someones garden, still warm from the afternoon sun, knows there is little resemblance to a store bought tomato. The abundance of flavor, the fresh tangy sweetness and juicy texture; It’s as good as a fresh peach, and each summer we wait and wait for the tomatoes to ripen. We eat the best ones fresh with sea salt, or a bit of good balsamic vinegar glaze, and the rest, the ones marred by bugs, rot, or blemishes, go into the freezer. We never seem to have enough to last throughout the winter, and each summer, as the beautiful fruits get larger and begin to ripen on the vine I wonder, Should I pick them yet? The dilemma is this. If I pick them green, they won’t get to ripen into the luscious red fruits that I love. 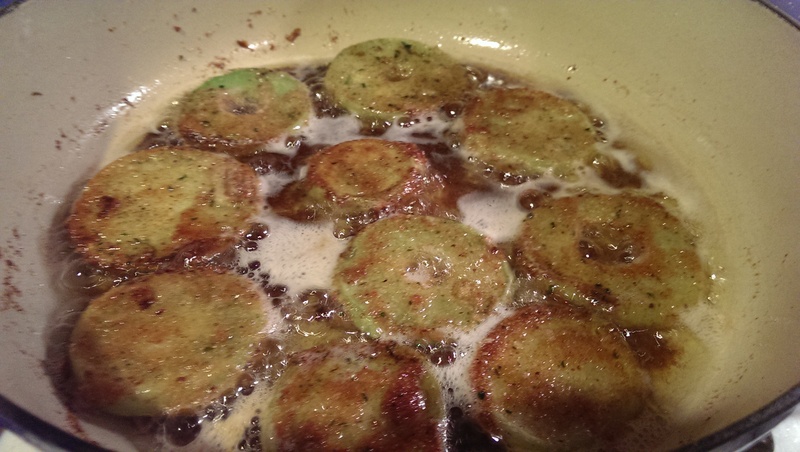 If I don’t pick them green, I won’t get to have fried green tomatoes. 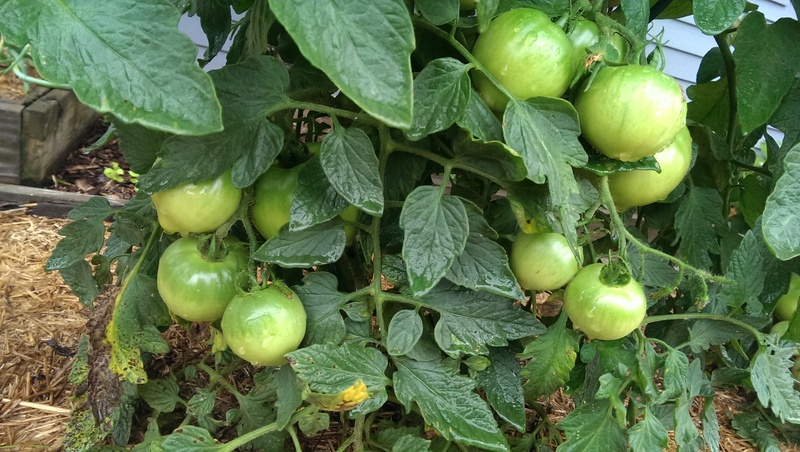 Fried Green Tomatoes are traditionally thought to be deeply southern dish and one I had never tried until my (Italian) mother in law decided to grow a garden. The recipe’s inclusion in cookbooks actually date back to the early 1830’s in the United States and are possibly of Jewish origin, first seen in the Midwest. In any case they are prepared throughout the US and everyone who has tried them know they are well worth the effort. In the end, I picked! Slice the tomatoes into 1/4 inch thick rounds, slicing off and discarding the top and bottoms (the breadcrumbs don’t stick to them) Mix the egg and milk together with a whisk. Heat a cast iron skillet to medium heat and add about a 1/4 inch of oil. 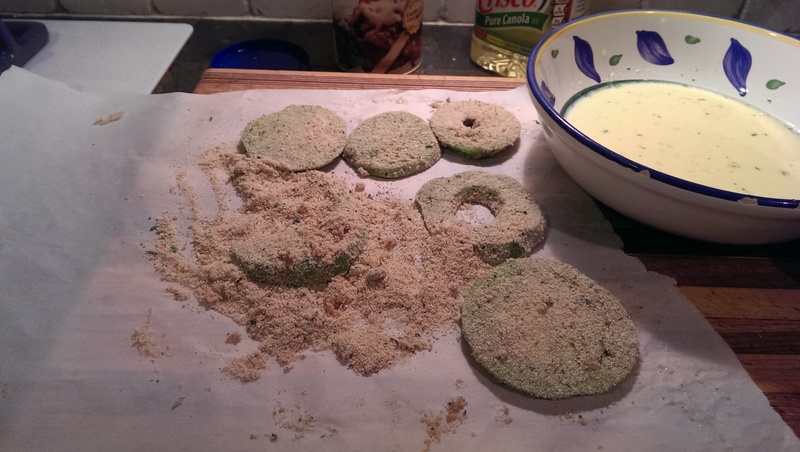 Dip the tomatoes in the egg mixture and coat them with the breadcrumbs. 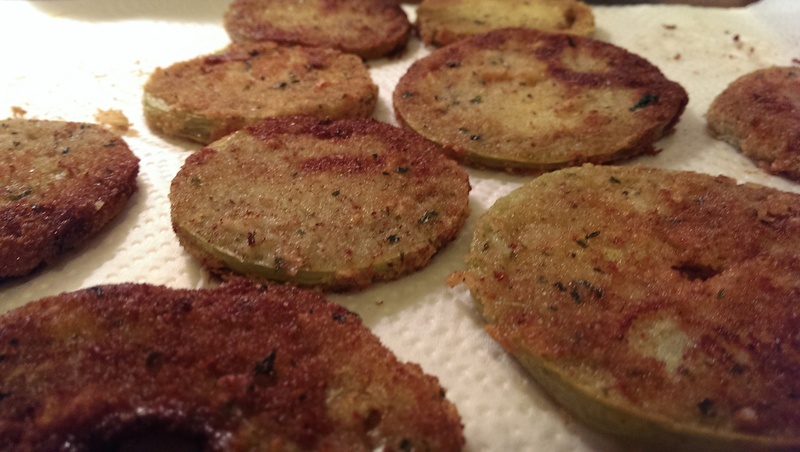 Fry the tomatoes in a single layer, flipping once when the breadcrumbs turn nicely brown. Drain on paper towels and keep in a warm oven. Serve with a remoulade of your choice. I made mine from mayonnaise, catsup, lemon juice and tabasco. Enjoy!